Serve Under 21 and the Party’s Over! 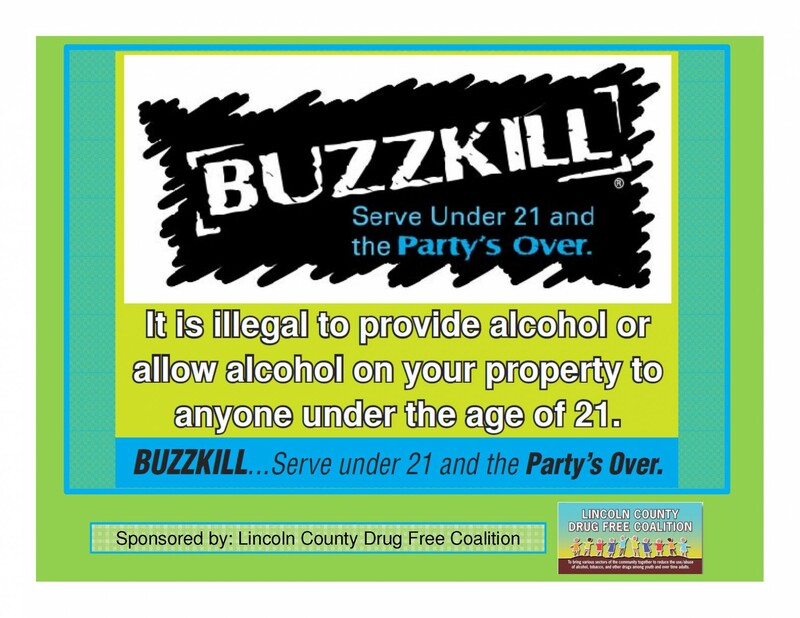 Each holiday season, the Lincoln County Drug Free Coalition promotes BUZZKILL: Serve Under 21 and the Party’s Over; a campaign focused on educating adults, especially those 21 through 24 years old, about the consequences of serving alcohol to underage individuals. Under Wisconsin law, anyone 21 or older who allows an underage person to drink or possess alcohol on their property is subject to hefty fines and even jail time. Serving to persons underage also opens the door for potential lawsuits. Social hosting is a first-degree misdemeanor, which can mean loss of scholarships or possible denial of a professional license (especially in the fields of health care, criminal justice and education). During the holidays, college students and young adults are returning home and celebrating with friends. It’s important that they step back and remind themselves of the potential consequences that can come from seemingly innocent fun. Adults are encouraged to protect themselves and their peers by refusing to supply alcohol to anyone under 21, making sure alcohol is not in the possession of an underage person while on their property and reporting underage drinking to law enforcement. The mission of the Lincoln County Drug Free Coalition is to work with the community to reduce the use/abuse of alcohol, tobacco and other drugs among youth and over time among adults. For more information contact Kristin Bath, Public Health Educator, Lincoln County Health Department at 715-539-1373. 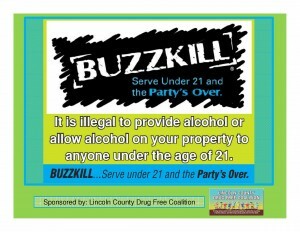 BUZZKILL: Serve Under 21 and the Party’s Over was developed by and is a project of Drug-Free Action Alliance.